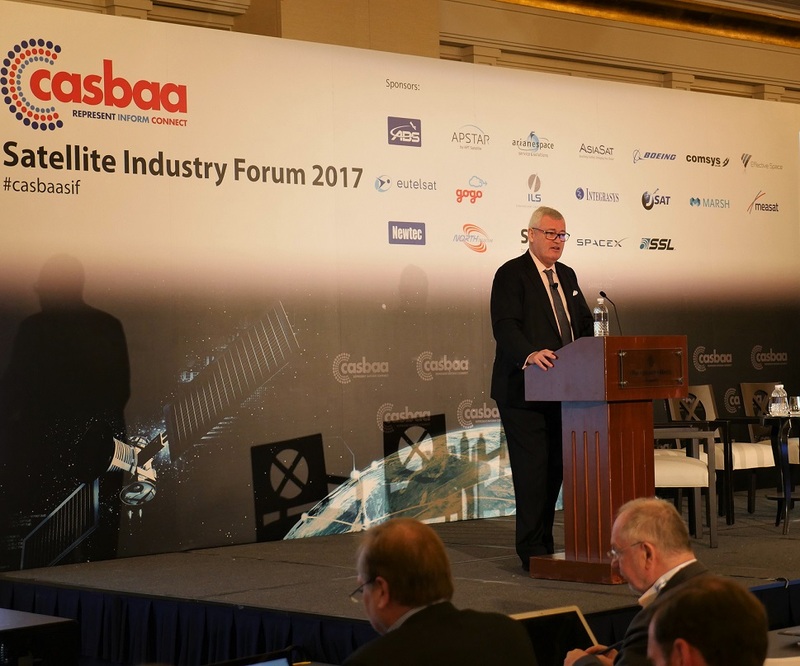 At the annual CASBAA Satellite Industry Forum in Singapore, our CEO Andrew Jordan gave the keynote address "Coming Back to Asia – the Challenges and Opportunities", starting the early morning session with encouraging insight to support the continued potential for Linear TV. There was evidence the majority of viewers were still using traditional TV as a way to kick back and enjoy themselves, dispelling myths of the imminent doom from new types of content delivery. With statistics showing HD growth as inevitable, and video distribution via satellite still representing about 70% of revenue for most GEO satellite operators in the region, Andrew placed firmly his belief that while UHD uptake may currently be slow, it’s application will be necessary to stay ahead of the content delivery game. He also touched on the future of HTS and how they will change the way data is delivered and costed, since they offer more efficiency, but said he would not expect them be able to completely replace the current FSS VSAT services. Sending a clear message to the industry, he reminded everyone that we should stay focused on what customers want, conveying optimism in the market for DTH, Maritime and Aviation opportunities. After the keynote Andrew was invited to join the Asia Pacific Satellite Leadership Round Table panel discussion, where he along with his industry peers animatedly talked on the future of satellites within a changing landscape, with a poignant reminder that it was time to get away from old excuses and reasoning based on echo chamber logic. Topics began on the back of themes Andrew brought to the keynote address, starting with content consumption via OTT vs traditional linear TV, giving him the opportunity to once again state the case that linear TV is not dead and actually presents the industry with a huge space for growth. The panel continued with the rise of HTS, and what it means for FSS; and with AsiaSat still seeing useful applications in current VSATs that cannot take advantage of the benefits of HTS, Andrew confirmed there is a reliance still on FSS. How 5G networks will affect the industry was another major issue, and Andrew shared the opinion that 5G will drive the future of broadcasting and communications networks, but crucially, that satellite has an essential role to play in that effort. The panel drew to a close with a brief look at the current trends in LEO business, and how they might be beneficial or detrimental to operators. Andrew reiterated his stance, explaining that from an orbital spectrum point of view it was a crowded space for AsiaSat to enter, especially with players far more advanced in the field, and that secondly, he doesn’t actually believe in the premise that LEOs will bring the cost of capacity down and make it more affordable. AsiaSat was also excited and prepared for one of the biggest and best shows in the Satcomm industry: CommunicAsia 2017. Hosted in Singapore at the Marina Bay Sands, we came with a brand new booth featuring the magnificent back lit model of our soon-to-be-launched AsiaSat 9. Ready to find the best solutions for those looking for quality satellite services, we enjoyed the opportunity to meet our partners both from decades ago, as well as put faces to names for the first time. Our sales and technical team offered insight into the services available when working with AsiaSat, spreading the word on our newest developments and discussing how best to provide what customers are seeking. AsiaSat 9, being AsiaSat’s largest ever satellite, has aroused a lot of curiosity for its new capabilities, particularly the new Ku-band beams customized for emerging markets like Myanmar, Indonesia and Mongolia, as well as high interest in OU solutions, and satellite delivered mobility solution, mobile backhaul and DTH services. Tommy Ng and Rajdeepsinh Gohil were invited to give presentations on “New Generation Satellite Serving Future Communication Needs” and “New Content Distribution Solution for Asia” respectively at the Xperience Zone, a platform where exhibitors showcased their expertise and latest solutions to the broadcasting and communications sectors. A large part of the show was spent sharing our enthusiasm for and demonstrating the very recently launched AsiaSat Mobile App, which grants users free and easy access to unique services we can offer, for example, finding the locations of our satellites via a GPS assisted Satellite Finder, Uplink & Downlink Calculators, Sun Outage Calculator and interactive footprints of the AsiaSat fleet.